This is the first in a series of posts that explore CorsPro’s SalesDoc Architect’s latest integration with Microsoft SharePoint. First, an in-depth look at why CorsPro chose SharePoint for file management and collaboration. Recently, when we were looking for ways to enhance collaboration capabilities within our software product, SalesDoc Architect (SDA), we investigated several options for improving file handling and document collaboration. File handling is an important aspect of SDA since it is deeply integrated with Microsoft Office and generates outputs (including proposals and statements of work) as Word and Excel files. 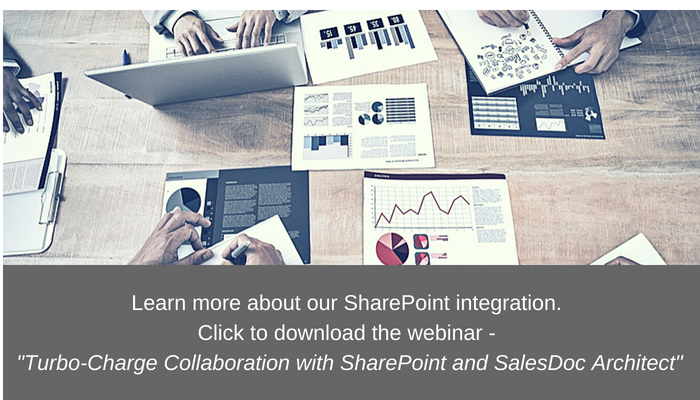 We quickly concluded that, hands down, Microsoft SharePoint provided the best solution for handling and collaborating on documents and files, especially files generated from Microsoft Office, with which SharePoint is tightly integrated. 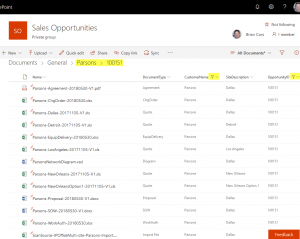 As a bonus, SharePoint includes a ton of additional collaboration capabilities, and it’s included at no additional charge with Microsoft Office 365 subscription plans. Before developing our integration with SharePoint, a mapped network drive was the default approach that our clients used to manage SDA files. Although we automated file handling by auto-saving quote and output files, the network drive approach was fraught with disadvantages (as I’ll discuss below). We also considered utilizing cloud-based mapped-drive third-party services, or hosting the files ourselves using Amazon Web Services (we currently utilize AWS to host our user dashboard). In the end, we decided that any “mapped drive” approach was too limited for the productivity boost we were seeking to gain for our clients, and that SharePoint was the answer. SharePoint is a collaboration and document management platform that users access via a web browser. It can be installed on an internal company server (the so-called “on premise” version), but the most feature-rich, modern, collaborative, integrated and cost-effective version is hosted by Microsoft as a component within its Office 365 subscription plans. I mention “modern” because the user interface, setup and configuration are so much more intuitive, attractive and easy to use than the “classic” SharePoint of old. SharePoint is not only a platform for document management, but it also provides collaboration features such as (intranet) websites, wikis, shared calendars, shared lists (including task lists) and discussion boards. In contrast to a mapped network drive setup where files are stored in discrete folders, documents and files are stored in SharePoint as records in a database. Each database record has several “fields” of data associated with it, including the field that contains the file data itself. SharePoint allows you to create additional data fields – or metadata columns in SharePoint parlance – that further describe the document record. For example, we might want to associate a document type, customer name and site description with each document record. This allows us to filter the list of documents based on exactly what we want to see, and we can create saved views that filter and sort documents according to our needs. Below, as an example, we’ve filtered the view to show documents where the customer name is “Parsons” and the opportunity ID is 100151. Because it’s a database, search functions are powerful and fast, and you can not only search within sites, but also across sites, to find the documents and items you’re seeking. With traditional network folders, search is the only way to “filter” files … and searching a folder structure is much slower than searching SharePoint’s database. File search, filtering and saved views are just the beginning of the file management advantages that SharePoint provides over a traditional folder-based approach. SharePoint automatically retains multiple versions of each file so that you can always pull up a previous version of a file and keep track of the changes made. SharePoint’s two-level Recycle Bin – where deleted files can be restored by a user via their personal Recycle Bin, or by an admin via the “Site Collection” Recycle Bin – protects companies from accidental or malicious file deletions. Moreover, SharePoint’s menu-driven approach to copying and moving files makes it much less likely that a user will accidentally delete or move a file. I can recount many times when I’ve “lost” a folder or file that I’ve accidentally deleted or moved using Windows Explorer. For SharePoint Online, files are stored in the cloud … meaning that users don’t have to be logged into their corporate network to access them. You can open and edit files on mobile devices via Microsoft’s SharePoint/OneDrive apps, and even sync SharePoint folders for offline access. For the technology integrator industry that we serve – with lots of mobile sales, engineering and operations people who often don’t have access to the corporate network – cloud/mobile access to documents and files is crucial. I mentioned above that SharePoint also provides collaboration features such as websites, wikis and discussion boards. SharePoint’s deep feature set also provides useful features like workflow automation and alerts (that alert users when certain conditions are met, such as modifications to documents), and you can gain valuable business intelligence by adding reports, scorecards and dashboards. In 2017, Microsoft introduced Microsoft Teams, a collaboration platform that combines team-centric messaging, meetings and document collaboration. Users can set up teams around projects and “areas of shared interest”, then create “channels” within each team to address specific topics. Although SharePoint has provided some of these same features, Teams simplifies the user interface, allowing users to quickly create teams and channels. On the surface, it might appear like Microsoft has built a collaboration platform that competes with SharePoint, but in fact SharePoint is the foundation upon which Teams is built, and when a new team is created in Teams, an underlying SharePoint site is also created. Microsoft has developed a deep, feature-rich application programming interface (API) that allows third parties to create applications that integrate with SharePoint. Since our software generates outputs such as proposals, statements of work, work authorization documents and contracts, we sought a document management solution with e-signature capabilities. Fortunately, industry-leading companies like DocuSign and Adobe Sign have developed e-signature services that integrate with SharePoint, making it easy for customers to buy products and services simply by e-signing proposals and work authorizations. We at CorsPro have developed our own set of Microsoft SharePoint automation features and functions that leverage SharePoint’s API, and we’ve provided those features and functions at no additional subscription charge to our clients. We’ve enabled SalesDoc Architect (SDA) to automate the saving/uploading of quote and output files, automate SharePoint site creation, and automate the upload of file-related metadata. In effect, we’ve automated much of the remaining human-required work to spin up SharePoint sites and save/upload files, complementing SDA’s ability to configure/quote complex technology solutions and generate deal-winning proposals and expectation-setting statement of work documents that can be saved into and managed within SharePoint. The SharePoint Maven website, in particular the blog articles. When I searched for answers to my SharePoint questions, the content from this website was often at the top of the search results. We were so impressed with the content on the site that we hired the maven himself, Greg Zelfond, to consult with us! SharePoint Online Essential Training. This LinkedIn learning video series, led by Gini von Courter, is an excellent training resource, and the navigation makes it easy to cherry-pick the topics you want to learn about.